This is a very interesting property in Thornbury High Street. In the early 1800s it seems to have been used by successive manufacturers of soap and candles. We think that the old soaphouse was on the site of the large building lying in the back of 45 High Street. This building is now used as a workshop for the opticians. We are not experts in dating buildings and we haven’t had a close look at the workshop, but it is possible that some of the old building is still detectable. For most of the last 150 years the main building on the High Street has been used as a grocer’s shop. On two separate occasions, first in the 1850 – 70s and then again in the 1970’s and 1980’s it had been used as the Town’s post office. We haven’t seen the deeds to this property. Our knowledge is based on snippets of information shown in the deeds of adjoining properties, supplemented by our usual supply of census records, rate books, newspapers etc. John Smith – John is listed as paying the rent charge in 1619 to 1621. We don’t know the connection between John and the William Smith mentioned above. He may have let the property out to John Mabbott from 1622 to 1632 as the book notes he was paying ‘for Mabbotts’ in 1624. The Widow Mabbott was paying the rent charge in 1633. The Dimorys – the account book show that Thomas Dimory was paying the rent charge in 1634 to 1636. He may have initially been renting the property from widow Mabbott, but he seems to have bought it as some stage as the Dimorys had a connection to the property for the next 35 years. In 1641 to 1656 Robert Dimory was paying the rent charge after which time they appear to let the property out to tenants: John Walker for Dimorys 1657 to 1663, Alice Walker for Dimorys 1664 to 1670 and William Pitcher for Dimorys 1671 to 1672. The Boys – the account books show that the ownership of the property transferred from the Dimorys to the Boys about 1673. The Boys continued to let the property out to tenants, William Pitcher for Buoys 1673 – 1679, Ann Smith for Buoys 1680, Joseph Smith for Buoys 1681 – 1683 and Thomas Farr for Buoys 1684 – 1696. Then from 1698 to 1710 Robert Boy was listed as paying the rent charge. We know very little about what the property was used for by these tenants but there is one clue. Accounts of the sufferings of the Quakers held at Gloucester Archives show that one of those who were persecuted at this time was Thomas Farr. In 1685 a group of them were fines and imprisoned for attending a meeting of Quakers or Friends in Thornbury. Included in the list was Thomas Farr a feltmaker who was committed to prison and then discharged having had “hatts to the value of £0 12. 0” distrained for payment of a fine of 10s for attending the meeting. William and Mary Grove – the accounts show William Grove was paying the rent charge from 1711 to 1719. We suspect that William was the son of William Grove cordwainer who was Mayor in 1695/96. Although William Grove junior was the eldest son he was left one shilling in his father’s will of December 14th 1707. He left his second son Thomas Grove his house and shop in the Burrough where William was living. William left to his son John Grove another property in the Burrough where Robert Wilshire and Elizabeth Hale were living. William’s daughter, Ann was left £20 and her sisters, Hester, Elizabeth and Mary were each left £15 when they reached 21. To leave your heir a shilling was a custom sometimes used in English wills (circa 18th century) as a clear means of showing that the person was intentionally being disinherited or ‘cut off’. In this case we do not know whether the shilling was an intentional insult or a sign that William was provided for in some other way. On 11th October 1703 William married Mary Boy in Thornbury. We assume that Mary was likely to be a daughter of the previous owner, Robert Boy and it is possible that the Boys still owned the property because they returned to the property after the Groves. William and Mary had at least three children: Elizabeth baptised 17th October 1703, William baptised 2nd January 1707 and Robert baptised 18th May 1708. William died and was buried on 7th May 1721. The accounts book shows Mary carried on living there until her death. She was buried on 22nd October 1726. Robert Boy – the Mayors Accounts show that Robert was paying the 4s 4d annual rent charge under the Hylpe Gift from 1729. We assume that Robert was related to the the previous occupants, the Groves, but we are not sure of the connection. Robert fell behind with his payments of this rent. In 1778 he was owing 7 years rent change. Then in 1780 Joseph Latch starts paying the rent change although it seems that Robert may still continue as the owner. There is a note attached in that year which says ‘Received of Robert Boy by the hands of Mr George Rolph who received the sum of Joseph Latch for nine years rent due at Michaelmas 1779 for a messuage fallen down and now a blacksmith’s shop in the Fore Street with a garden and stable belonging‘. We suspect that this means that Joseph was using the blacksmith’s shop for his business as a nailer. Joseph Latch lived across the road at 34 High Street. Joseph died in 1794 and the Mayors Accounts indicate that his son, William Latch took over until 1808. Richard Gwynn – Richard is named as the owner and occupant of this property in several indentures relating to adjoining properties. Richard was a soap boiler. The land tax records appear to show Richard was owner and occupant from 1809 to 1814. He had been operating as a soap boiler in Thornbury for several years as we have traced the record of John Carwardine being bound as an apprentice soap boiler to Richard Gwynn in 1794. The Carwardines – the property was associated with two John Carwardines. We had initially thought that they were father and son, but we discovered an indenture calling the younger John Carwardine the ‘nephew’ of the older man. According to the land tax records John Carwardine the elder initially rented the property from Richard Gwynn from 1819 or earlier. He had been taken on by Richard Gwynn as an apprentice soapboiler in 1794. His nephew, John Carwardine the younger who was also a soap maker took over the occupation of the property when his uncle moved to Bristol about 1828. The 1840 Tithe Survey shows that John Carwardine as the owner and occupant of Plot 163, a house and garden. We know from the 1841 census that John Carwardine the younger was living there. The Carwardine’s soaphouse was on the premises and the manufacture of soap carried on here until about 1844, and the manufacture of candles carried on for a few more years after that. On the 1840 Tithe Map (shown on the left below) the property was Plot 163. You can see that just behind the main building fronting the High Street (which is the street on the left) there is a large building and another smaller building at the bottom of the garden fronting St Mary Street. We believe that the large building was probably where the soap and candles were made and the small building fronting St Mary Street was the coach-house referred to in some deeds. It is interesting to note that there is still a large building just behind the High Street house and shop. This is now used by Mann’s the opticians but it seems possible that the building had its early origins as the soaphouse as it is the same location and roughly the same size. In the photo on the right below you can see through the gates of the coach-house fronting St Mary Street to the rear of the green building which might have had its origins as the soaphouse. The Shepherds – the Mayor’s Accounts show that George Shepherd took over the payment of the charge for the Hylpe Charity in 1848/49. The 1851 Census shows that George was occupying the property now known as 45 High Street. The census shows George was a grocer aged 39 and born in Morton. His wife, ‘Annah’, was aged 40 and born in Winterbourne. They were living with their sons, Thomas an assistant grocer aged 18 and William aged 13 and a daughter, Anna M aged 8. On 10th February 1831 George married Anna Maria Evans in St James Church, Bristol. By 1839 they had moved to Thornbury. The 1839 Robsons Directory lists George Shepherd as Post Master and Shopkeeper in the High Street. The 1840 Tithe Survey and the 1841 Census show George Shepherd as the Postmaster living at 65 High Street. He was aged 28 living with Anna his wife aged 30 and their sons: Thomas aged 8, William aged 4 and John aged 1. Anna was the daughter of Thomas Evans, the baker of Thornbury. George continued to be listed in 1842 Pigots Directory, 1849 Hunt & Co Directory, 1852 Slaters Directory and 1856 Post Office Directory and 1868 Slater’s Directory. We know from the records of the Postal Museum that George’s salary for running the “subordinate office” in Thornbury was £16 a year. Various sources show George had to supplement his income from the Post Office. The 1851 Census shows George was a grocer. The 1856 Post Office Directory indicates that George was also trading as a tallow chandler and Norwich Union Insurance Agent. The 1861 Census also shows George Shepherd as a grocer and that he and Anna Maria were living there with their children: William aged 25 and Anna Maria aged 18 and a grand-daughter, Mary A aged 1. We assume that Anna Maria died in 1869 although the age given in FreeBMD website shows her age as 69 not 59. George died in 1870 aged 58. The 1871 Census shows that George’s son, William Evans Shepherd, had taken over the grocer’s business. The bill head on the left shows George Shepherd’s name is crossed through and W E Shepherd’s name is substituted. Click on the image to see more details. We assume that William also took over the post office. The 1871 Census shows the property still occupied by William Evans Shepherd. He was described as a grocer a widower aged 33 born in Thornbury. Living with him were his two sons, William George aged 8 and Edward Henry Ernest aged 6 both born in Thornbury, his unmarried sister, Anna Maria who was aged 28 and assisting in the shop, a niece, Mary Ann Shepherd aged 11, Anne Emma Taylor a shop assistant aged 16 from Liskeard, Cornwall and two servants: Jane Limbrick a housekeeper aged 39 and born in Shellards Lane, Alveston and Annis Hendy, a general domestic servant aged 17 born in Tytherington. We are not sure about when nor where William was first married, although we note that an Elizabeth Shepherd died in Thornbury in 1867 aged 38. By February 1876, William had run into financial difficulties. There was a sale of goodwill, fixtures, stock in trade and household effects by ‘Trustees in Liquidation’ so we assume William had to give up the business. This seems to coincide with Henry Robbins becoming the new postmaster. William appears to have moved to London. When he married Emma Ann Screen in Thornbury on 3rd September 1879, he described himself as an accountant and his address was St Mary Hill, Rood Lane, London. Emma Ann was the daughter of James Screen the Thornbury baker. The 1881 Census shows William was a tea traveller living with Emma Ann and his children in Luton Villa, Camberwell, London. William George was a draper and Edward was a grocer. They remained in London and William continued as a tea dealer. William died in 1914. Thomas Nelmes – the 1876 Rate Book shows that the property was then occupied by Thomas Nelmes. We are not sure which Thomas Nelmes. The 1880 Rate Book indicates that the property was void, having been vacated by Joseph Pitman on 25th December 1880. The 1881 Census shows the property as unoccupied. James Leslie and Kathleen Pearce – the 1931 electoral register shows the property was taken over by James Leslie and Kathleen Pearce. ‘Leslie’ was born on 29th January 1906, the son of Frederick William and Annie Pearce who lived at Henbury. Leslie’s sister, Vera Gwendoline Pearce had married Colin Francis Garrett of Park Farm, Thornbury in 1915 so there were already some connections with the Thornbury area. In 1929 Leslie married Kathleen Bryant, the daughter of Arthur Edward Bryant and his wife, Mavis (nee Ayris) who also lived in the Henbury area. Kathleen was the sister of Norman Bryant who later also moved to Thornbury and ran the garage in St Mary Street. Leslie and Kathleen had one son, David James who was born on 17th April 1936. Tragically Kathleen died within a short time of David’s birth aged 30. He married again later. His second wife was Ethel Ponting who he married in 1939. Ethel was born on 9th August 1915, the daughter of Herbert H. Ponting and his wife, Celia M (nee King). 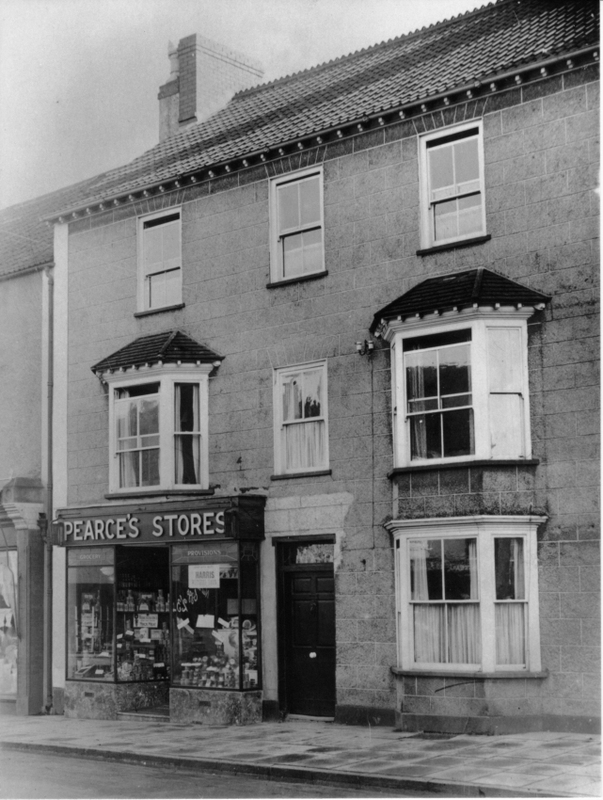 We understand that Leslie ran the grocer’s shop at 45 High Street and from about 1961 he ran another grocer’s shop called Thornbury Supply Stores at 5 High Street. We have been told this became the town’s first ‘self service’ grocery shop. By 1961 he had moved to live at Heatherfield in Rudgeway. The shop at 45 High Street was eventually taken over by Leslie’s son, David, when the Post Office moved into the building from 28 High Street. David had married Valerie M. A. Ford in 1958 and they lived there over the shop until the late 1960’s when they moved to 13 Orchard Grange. Valerie was born in 1935, the daughter of William and Ethel Ford of Lower Farm, Cowhill. David became the town’s sub-postmaster for many years, running the town’s Post Office from 45 High Street. It remained there until the late 1980’s, when David retired. The shop was then rented out, having a coffee shop/antique shop upstairs called Granny’s Attic. Leslie died in October 1990 aged 84 years old. David Pearce died in 2003 aged 67 years, but the building still remained in the ownership of the Pearce family. In more recent times the property has been divided. For many years Manns the opticians used the old post office part on the left hand side of the building. They were replaced by another opticians Armstrong and North. The other part has had a number of occupants including Omega Land Computer Supplies, La Mode Exchange and Wallace Barbers.